Once per turn: You can banish 1 face-up Ritual, Fusion, Synchro, Xyz, Pendulum, or Link Monster you control; this turn, the effects of monsters with the same card type as that banished monster (Ritual, Fusion, Synchro, Xyz, Pendulum or Link) are negated. We are still diving into Soul Fusion with some of the more interesting cards of the set, starting off with Invincibility Barrier. Invincibility Barrier is a Continuous Trap that once per turn lets you banish a face-up Ritual, Fusion, Synchro, XYZ, Pendulum, or Link and for the rest of this turn, the effects of monsters of the same type as the six I just mentioned are negated. I feel this can be useful eventually. Shutting down the effects of your opponent’s Extra Deck monsters with powerful effects will hurt them, especially if their deck revolves around that mechanic. It will likely be a side deck card in the future for a mirror match or with two Link/XYZ/Synchro/etc. Spam decks. Solid card with some strong future potential. Art: 4/5 Herald Link Monster when? This week I decided we’d look at some more underrated or overlooked cards from Soul Fusion, and we don’t really have a theme here. Kicking things off is Invincibility Barrier. This is a nifty little Continuous Trap (which we know isn’t a good thing) but it does a good thing. I’m a fan of cards that can be disruptive, and this one has potential to be very disruptive indeed. 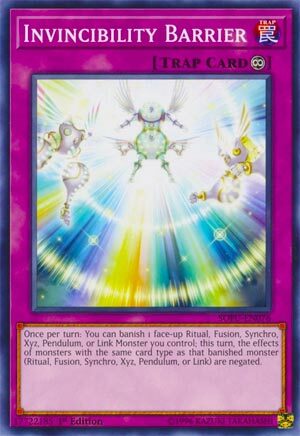 This Trap lets you remove from play any one face-up Monster you control, regardless of type…so this encompasses everything: Ritual, Pendulum, Fusion, Synchro, XYZ, or Link, and whatever you choose to remove, all Monsters face-up on the Field (note all, so yours and those your opponent controls) have their effects negated for the current turn. Talk about versatility, no? Let’s talk about the removal aspect…honestly, I see this could be a winner for Thunder Dragon engines, as we just spent a couple weeks reviewing them, and how removal for them can be a positive aspect. Now, granted, you might not have a Monster you need to remove to negate the specific type at the time you need it, but I see this as a solid side-deck card as well. You might need specific knowledge about what your opponent is playing in order to fully be able to utilize this. But I still see some good potential here. Art: 4/5 I get the barrier, I can see it, and the blue/gold color scheme is nice. Yet, I’m not sure this showcases invincibility either. Still a nice picture though.